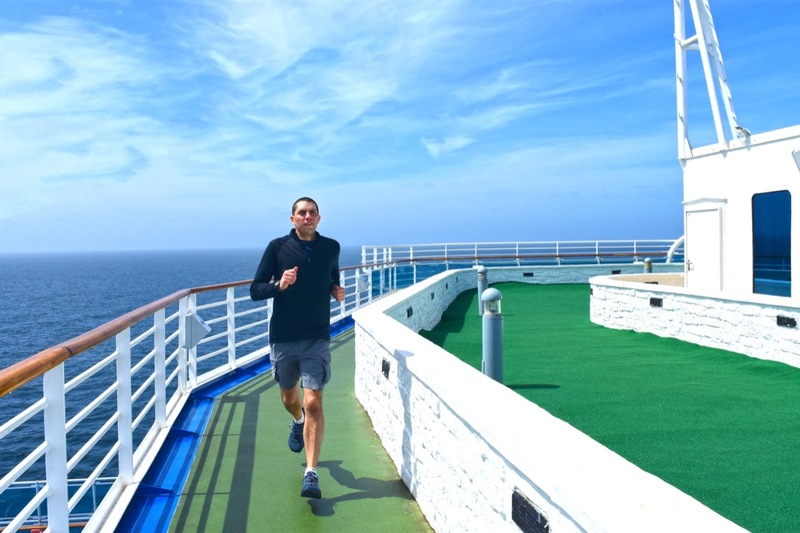 In April I decided it was high time to change that, so I ran a solo 100-miler on the running track of a Princess cruise ship out on the ocean. My friends suggested a few creative names for the adventure. A few of my favorites were the “Seasick 100”, the “You’ve Got to Be Shipping Me 100,” and the “Soft Serve 1600” because of my intention to eat as many soft serve ice cream cones as possible during the run. My soul started to cry a little bit when I arrived at the ship’s track and saw that it took 16 loops to make one mile. To put this in an enormously more depressing perspective, that means 1600 loops to make 100 miles. Previously, I thought that listening to Celine Dion’s song “My Heart Will Go On” without cringing was the most difficult thing associated with cruise ships. I can now attest that running 1,600 loops on the deck of a ship is more challenging. (But only slightly more so). I used a Garmin foot pod to keep track of my distance. And although I knew the GPS wouldn’t be accurate, just for fun, I recorded the run on Strava too. Considering that the boat was moving while I was running, my Strava route shows that I ran 336 miles across the ocean averaging 4:57 per mile. Somewhere Usain Bolt is raging with jealous envy of my speed. Or maybe not. I had only made it 22 miles before reaching the “What was I thinking?!? !” phase. Mile 22 is far too early to be reaching a crisis point like this. Typically I don’t move into this phase until at least mile 60. That’s the time when I turn my music up as loud as possible and try to go to my happy place where I let Bruce Springsteen comfort and distract me from the temper tantrum being thrown by my quads, knees and calves. (Spoiler alert: even The Boss isn’t good enough to distract from that kind of tantrum). Every mile felt like it took an eternity, but finally after 27 hours and 47 minutes I reached the finish line of what I had decided to dub: The Ship for Brains Challenge. The finish line looked like every other square inch of that running track except for the fact that my wife and kids were standing there with a belt buckle to hand me. The buckle has a picture of a sun setting on the horizon of the ocean. We brought it just in case I actually finished the run. Some people (okay, smart people) may argue that this sounds like a horrible way to spend a day on a cruise. I can’t say I disagree with them. I’m just too antsy to sit by the pool all day drinking piña coladas. My muscles want to be moving. Although I questioned my sanity approximately 1,600 times, when all was said and done I was thankful for this unique and challenging experience. And in the end I ate far less than 1,600 ice cream cones during my run. But I felt absolutely no guilt when I approached that number of ice cream cones consumed in the remaining six days of the cruise.